Group III: 13–14 years old. T-shirt and jeans with head cap for females (FE). The photographs included were with same background and with same stance of the models. All the other factors were kept similar in photographs except for the attire [Figure 1]. After a brief introduction and instructions about how to answer the questionnaire, a child was given the questionnaire with photographs of male and female dental surgeons in different dental attires. Children were asked to give preferences so as to answer a question “by whom you would like to get your treatment done?” Separate preferences for male and female photographs were recorded. Children were provided with the questionnaire for parents. The completely answered questionnaires by children were collected on the same day from the children and by parents the next day. The collected data were compiled and analyzed. 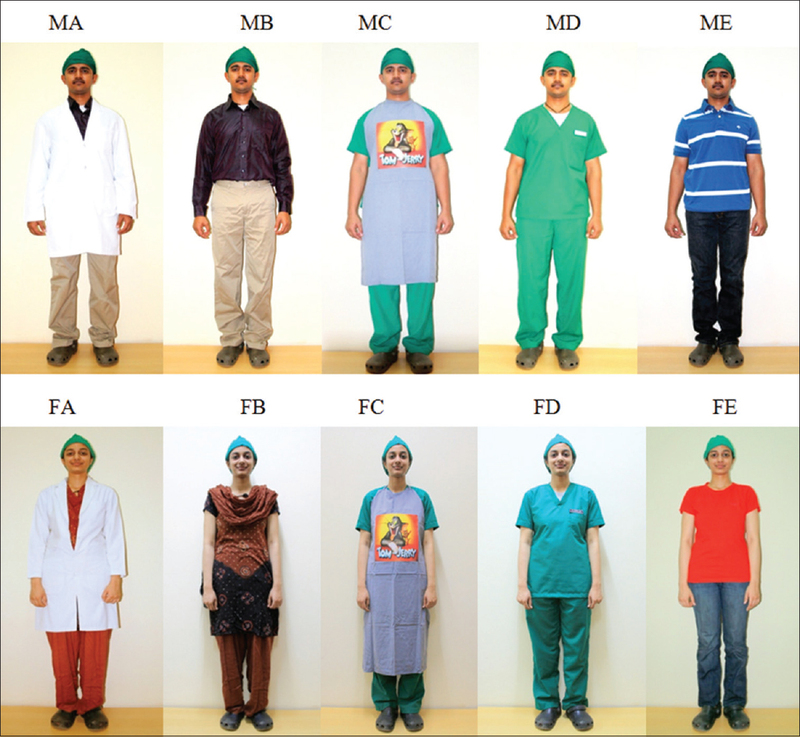 Figure 1: Photographs of male and female dental surgeons in different modes of attire. A total of 2500 children from different schools of Dharwad district aged between 9 and 14 years were interviewed and questioned individually for their preferences for different kinds of dental attires and were given the questionnaire. Out of those, 244 children failed to return the completed questionnaire meant for parents. A total of 568 completed questionnaires were rejected because of provision of incomplete information. The remaining 1688 completed questionnaires were analyzed critically using different statistical tests and the following results were obtained. The most preferred attire by children (35.6%) for male dental surgeons was found to be shirt and trousers with a white coat. The most preferred attire by children (38.2%) for female dental surgeons was, on the other hand, found to be salwar kameez with a white coat. Out of the five different kinds of dental attires, white coat was the most preferred attire for both male and female dental surgeons. 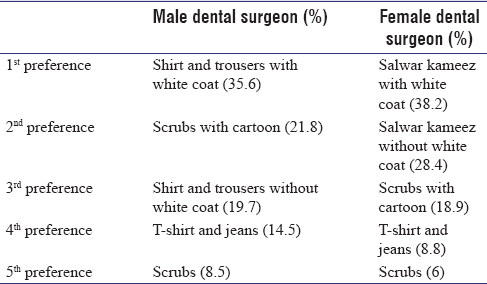 For male dental surgeons, scrub with cartoon was the second most preferred attire by 21.8% children closely followed by the formal attire (19.7%). For female dental surgeons, the second most preferred attire was formal attire without white coat by 28.4% children followed by scrub with cartoon (18.9%). Nontraditional or casual attire such as T-shirt and jeans was less preferred by children as 14.5% children chose it for male dental surgeons whereas only 8.8% children chose it for female dental surgeons. Plain scrub was the least preferred attire as <8% of children preferred it both for the male and female dental surgeons [Table 1]. To check the influence of age group on children's preferences, they were divided into three age groups as 9–10, 11–12, and 13–14 years. All the age groups chose white coat (P = 0.000) as their first choice, particularly the older age groups (13–14 years) as 44% children from this age group preferred it. Though other age groups, i.e., 9–10 and 11–12 years, also, preferred white coat the most, there was less difference in the frequency between the 1st and 2nd most preferred attire in these age groups. All the age groups preferred formal attire without white coat and scrubs with cartoon as the 2nd and 3rd most preferred attires, respectively, for the female dental surgeons. For male dental surgeons, the preferences were not clearly segregated for formal attire and scrubs with cartoon as almost a similar number of children preferred both the attires; however, still a slight inclination toward scrubs with cartoon in older age group was noted. Younger children showed more liking toward casual attire than older age group as about 16% of children from 9 to 10 and 11 to 12 years' age groups preferred T-shirt and jeans for the male dental surgeons while only 10% from 13 to 14 years' age group preferred it (P = 0.0032). Less number of children preferred T-shirt and jeans for female dental surgeons compared to that of male dental surgeons. 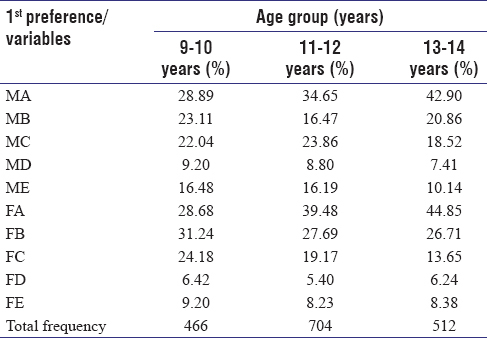 All the age groups showed a strong negative response toward scrubs as only <9% of children preferred it for both the male and female dental surgeons (P = 0.009) [Table 2]. To check the influence of socioeconomic status for preferences for different kinds of dental attires, children were divided into five classes including the upper class, upper middle class, lower middle class, upper lower class, and lower class, and it was observed that upper class showed a definite preference for formal attire without white coat as 44.44% of children preferred it for the female dental surgeons whereas 27.5% of children preferred white coat to make it the second most preferred attire for female dental surgeons. Though higher percentage of children preferred white coat for male dental surgeons, there was very less difference in the frequency of children between the 1st, 2nd, and 3rd orders of preference in upper class. All the other groups showed a definite preference for white coat, with the highest response seen from lower class as 46.8% of children chose it for both the male and female dental surgeons. All groups chose scrub with cartoon and formal attire without white coat as the 2nd and 3rd most preferred attires, respectively, for male dental surgeons except for lower class which chose formal attire as the 2nd preference for male dental surgeons with a frequency of 28.8%. For female dental surgeons, formal attire and scrub with cartoon were the 2nd and 3rd most preferred attires, respectively, and responses obtained were found to be consistent for the female dental surgeons. Though children showed a kind of low response in total for casual attire, i.e., T-shirt and jeans, the percentage of children choosing it for male dental surgeons was on higher side than for the female dental surgeons. A scrub was invariably the least preferred attire by all classes [Table 3]. 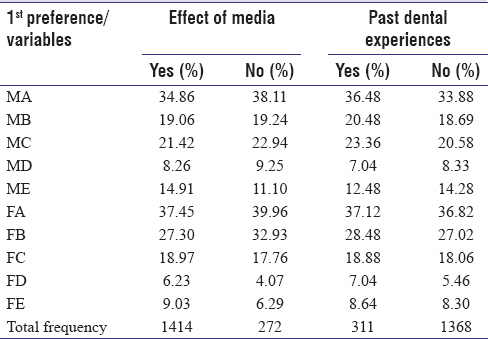 To check the effect of media on preferences, children were divided into two groups including the ones who had seen dental surgeons on television before and those who had not seen. After comparison, no significant differences were found between the two groups. Similarly, to check the factor of past dental experiences, children were divided into two groups including the ones who had visited dental clinic before and those who had not. Here, also, no notable difference was found [Table 4]. Kuscu OO, Caglar E, Kayabasoglu N, Sandalli N. Short communication: Preferences of dentist's attire in a group of Istanbul school children related with dental anxiety. Eur Arch Paediatr Dent 2009;10:38-41. Barrett TG, Booth IW. Sartorial eloquence: Does it exist in the paediatrician-patient relationship? BMJ 1994;309:1710-2. Zwart DL, Kimpen JL. The white coat in pediatrics: Link between medical history and preference for informally dressed physicians. Ned Tijdschr Geneeskd 1997;141:2020-4. Marino RV, Rosenfeld W, Narula P, Karakurum M. Impact of pediatricians' attire on children and parents. J Dev Behav Pediatr 1991;12:98-101. Mistry D, Tahmassebi JF. Children's and parents' attitudes towards dental surgeons' attire. Eur Arch Paediatr Dent 2009;10:237-41. Keenum AJ, Wallace LS, Stevens AR. Patients' attitudes regarding physical characteristics of family practice physicians. South Med J 2003;96:1190-4. Gjerdingen DK, Simpson DE, Titus SL. Patients' and physicians' attitudes regarding the physician's professional appearance. Arch Intern Med 1987;147:1209-12.